Stephanie Schuler, front, and Steve McClung, middle, of Colorado Parks & Wildlife, and Mike Japhet, a retired aquatic biologist with Colorado Parks & Wildlife, check fish cages Friday afternoon on the Animas River. At that time, spokesman Joe Lewandowski said of 108 rainbow trout fingerlings in cages placed in three separate areas in the river, only one had died so far. A fourth cage was placed elsewhere as a control subject. 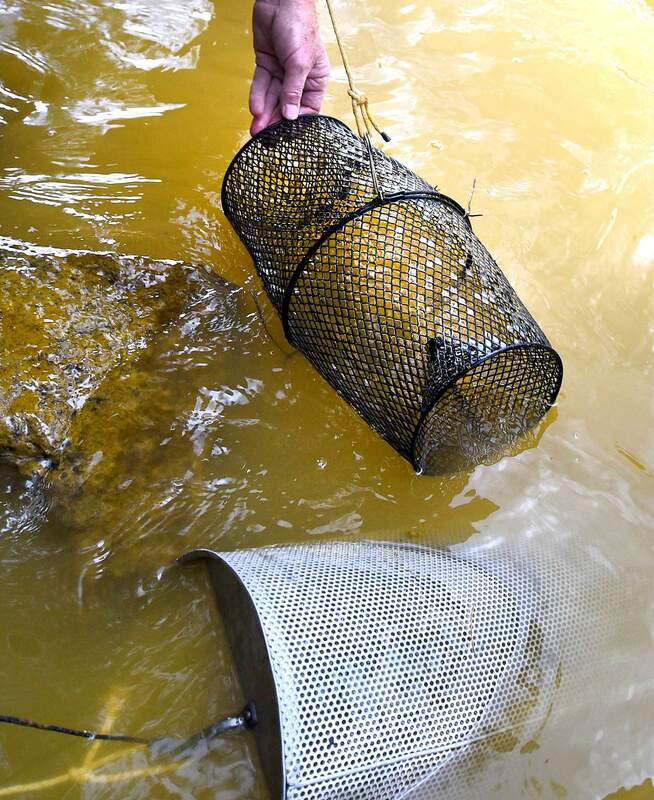 Colorado Parks and Wildlife spokesman Joe Lewandowski said the agency is checking fish cages in three different locations on the Animas River several times a day to determine how the metals in the river are affecting them. As about 1 million gallons of toxic sludge makes its way from Gold King Mine down the Animas River, scientists, politicians and Durango residents are bracing for the environmental fallout. At a public meeting Friday, the Environmental Protection Agency said initial testing indicates the water contains levels of cadmium, lead, aluminum, copper and arsenic too high for safe drinking water. In an interview after the meeting, David Ostrander, program director for the EPA’s Preparedness, Assessment and Emergency Response, said the agency is closely monitoring wildlife. Right now, fish are ecologically playing the role of a canary in the mine shaft, their survival serving as an indicator of the mine spillage’s greater impact on the environment. Joe Lewandowski, spokesman for Colorado Department of Parks and Wildlife, said test fish seem to be withstanding the onslaught of heavy metals: Of the 108 fingerling rainbow trout that Parks and Wildlife submerged in cages along the Animas River on Thursday night, Lewandowski said one had died. Though an encouraging sign, Lewandowski said the real question is how the fish fare after four or five days of protracted exposure to the metals surging through the water. And it could take months to understand the full impacts, including what happened to insects, whether brown trout are reproducing and what effects metal-laden sediment will have on the riverbed, he said. “It’s not something we can figure out instantly,” Lewandowski said. 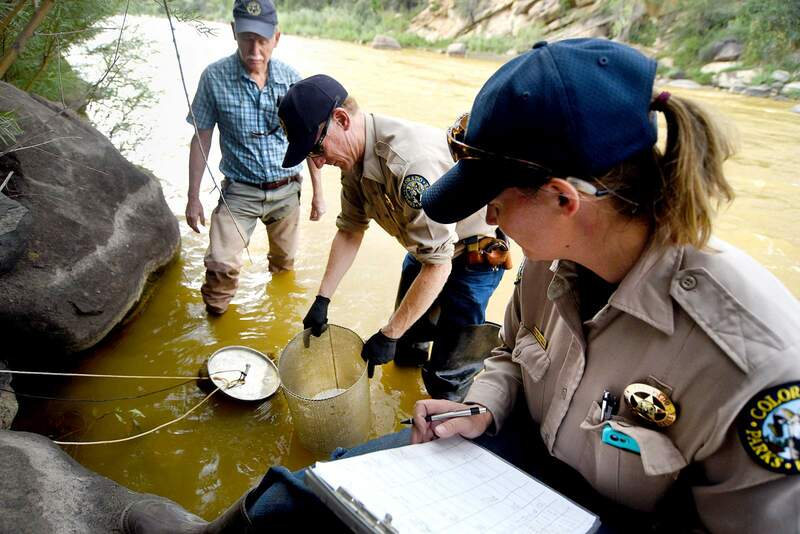 Ostrander said the EPA is making arrangements to analyze whether the mine spillage has poisoned the invertebrate species living in the Animas – in some ways a more significant biological test of the environmental harm caused by the Gold King spillage and the ecosystem’s long-term fragility. Though it may takes months before the environmental damage wrought by the Gold King spillage is understood, it’s not the first time Durango has seen Silverton’s mines spew contaminants downriver, causing regional environmental disasters. In 1974, miners breached one of Silverton’s main tailing ponds, causing 100,000 tons of gray sludge to surge into the Animas River, washing away a part of the highway and prompting regulators to fine the mining company. At Friday’s public meeting, the larger consequences of the Gold King spillage on animals – and plants – living in the Animas River was at the forefront of many people’s questions. “Humans are only one part of the ecosystem,” said Fort Lewis College environmental studies professor Janneli Miller. Ostrander assured her that the EPA is determined to save animal species. “If you are seeing signs of animals that are dying, you let us know,” he said. This story has been corrected to reflect that Allan Bird was general manager of Standard Metals Mine, not a miner.